While in law school, I was intrigued by the general absence of required coursework on law firm management issues. Where do new practitioners learn how many hours each week should be allocated to marketing and client development? Beyond the professional conduct rules, what are the dos and don’ts of client trust accounting? What are the advantages and disadvantages of various lead-generation techniques? Perhaps rightfully so, most law school coursework is aimed at providing a foundation for a student to develop into an effective legal practitioner – in short, law school teaches students to win cases. Author Kerry M. Lavelle intends his recent book as a response to an often-disregarded truism: the knowledge, skills and concerns of a quality legal practitioner are quite distinct from those of the successful law firm manager/owner. In The Business Guide to Law, you won’t find discussion of legal doctrines, or learn elements of causes of actions. Excepting certain legal ethics issues, you won’t find anything that appeared on the bar exam. Instead, as the title suggests, this is a book about business. Drawing on nearly 30 years of experience, Lavelle advances his concept of “the five-tool attorney” – the legal professional who not only provides high-quality legal services to his or her clients, but who drives business growth and entrepreneurial opportunities. Lavelle divides the book into three sections – the startup, the plan for growth, and the succession plan. The startup section includes discussion of many operational issues that apply to any business – banking and payroll management, controlling overhead costs, and staff considerations. But throughout the book is a recurring acknowledgment that the law firm is a business enterprise like no other. The attorney-client relationship itself comes wrought with ethical and professional considerations that can impact business concerns. Lavelle gets into the trenches on logistics and how various management practices can affect a firm’s bottom line. Legal billing, for example, gets a lot of discussion. Every new legal practitioner has at least a tacit understanding of the role of the all-powerful billable hour. But what about managing accounts receivable and cash flow in a law firm? How do “value billing,” contingency-fee agreements, and other legal billing methods impact a firm’s ability to remain competitive? Another engrossing topic Lavelle addresses – for both the new firm, and the firm looking to grow – is relationships in the business of law. Again, the author goes well beyond the generic axiom that relationships matter in business. How can relationships with clients, colleagues and other professionals lead to increased prospects for a law firm’s growth? How is the leveraging of referrals a function of organic relationships for Lavelle’s five-tool attorney? How can a law firm best utilize chambers of commerce or trade association activities amid social media and other evolving marketing technologies? Of special value to readers is that Lavelle does not hesitate to admit what didn’t work well for his firm over the years. Rather appropriately, some practice pointers and lessons learned are offered in the context of our changing industry. This book doesn’t read like a scholarly work, but it would be of tremendous value to third-year law students about to face the challenges of today’s job market. The more than 60 pages of forms and administrative templates will be of particular use to new practitioners as they develop tools for the toolboxes of their own firms. Experienced firm managers may find the chapters devoted to startup operations tedious, but they’re a must-read for solo practitioners with limited or no prior business experience. The more experienced businessperson will still appreciate the chapters on firm growth and succession planning. If and when a legal practitioner hangs their own shingle, no book can adequately prepare one for the experiences that follow. The joys and challenges of law firm ownership are often realized through trials by fire. 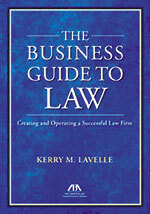 But Lavelle’s Business Guide to Law offers heartening insight into many of the challenges faced by law firm operators, especially those beyond winning cases and providing high-quality legal service to clients. From the nuanced business aspects of the attorney-client relationship, to managing legal talent and firm branding, readers will learn about many of the trials to be expected in this forever-unique business enterprise.